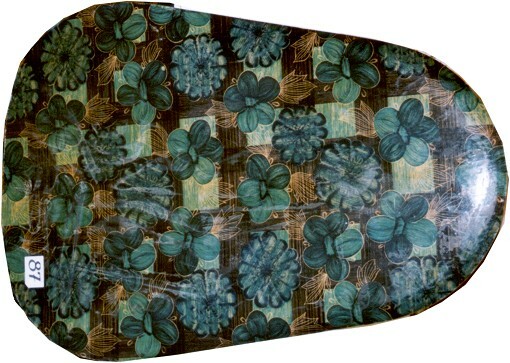 1960 Paipo/Belly Board 3 ft 5"
Plywood with fabric laminated bottom. Branded decal. Varnished. Catalogue No. 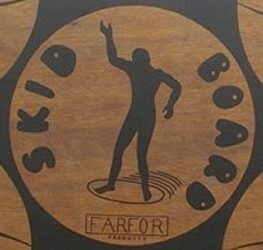 82 : " PAIPO BOARD 1960's All time rarity, plywood: great condition." Notes by Mick Mock PO Box 330 Manly NSW Australia 2095. "Paipo as used in Hawaii probably only developed wide tails in the early 1960s courtesy of John Waidelich and Jim Growney. Known as the Paipo Nui, Valentine commercialized, rather than developed these boards." 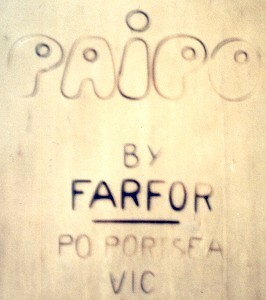 An article, The Paipo Board by Val Valentine with photographs at Sunset Beach, appeared in The Surf Guide, January 1965. The header proclaimed It's smaller, faster ... and 300 hundred years old! 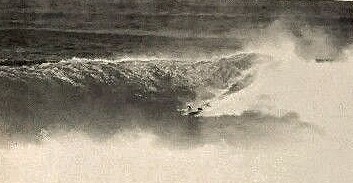 Paipo rider, Sunset Beach, 1965. Val Valentine and Paipo board, 1965. I was browsing, and came across one of the paipo boards that I designed and built long ago. I notice that you are a little short on detail, so I thought I would fill in some of the missing bits. I watched Val Valentine as he made a Paipo for me in Hawaii, and could see that there would be a better way of doing it. He laid vaneers of timber in this with glue between, then pressed the whole thing with sandbags on top. When the glue had set, he trimmed and finished the board. I could see that this was not working out at all, and returned to Australia with one of his regular (non concave) Paipo boards. Back in Australia, I built a press that had a concrete base mould at table height, and was loaded with a hydraulic powered airbag. This makeshift thing ran off mains water pressure and put over 20 ton pressure on the boards while the glue set. I then tried using layers of eighth inch thick hoop pine plywood, and found that with the extreme pressure that I could form the two way curve (shallow dome) at the nose of the board. With the stresses in the plywood, the curvature at the nose was less than with the timber vaneer. By chance, this turned out to be just right. The boards were a lot faster than those made by Val, but the nose never went under on takeoff. Because the shape of the board is set by the concrete base mould, trying out new shapes is a lot more difficult than when shaping from a foam blank; so I counted myself lucky to have done so well. I was never an obsessed body boarder, and used all types of boards. Even so, the finless flat bottomed Paipo is still my favorite. You can get out through the wildest surf by swimming with the board under waves (the Paipo only just floats), and once you lever yourself onto a huge wave, the rigid flat finless bottom will give unbelievable speed. Turns are made by moving to one side and tilting the board onto that side rail. Turning is an art, and if you lose your grip on the water, you will spin out. If you have any queries, I would like to hear. Note: In 1957, Jamie Farfor ordered a 9ft 10" balsa surfboard from Bill Clymer of Manly, and had the board shipped to Victoria. 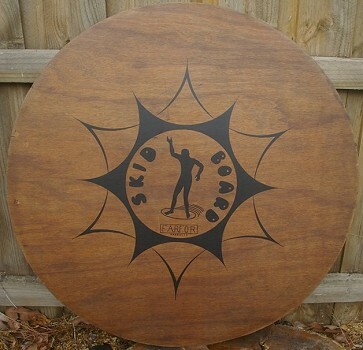 Board by Paul Lindbergh's Hawaii Paipo Designs. Sean was a life guard at the Ehukai Beach (Pipeline) during the1970's. Rod Rodgers, Baltimore, Maryland : My Paipo Boards and ...More.